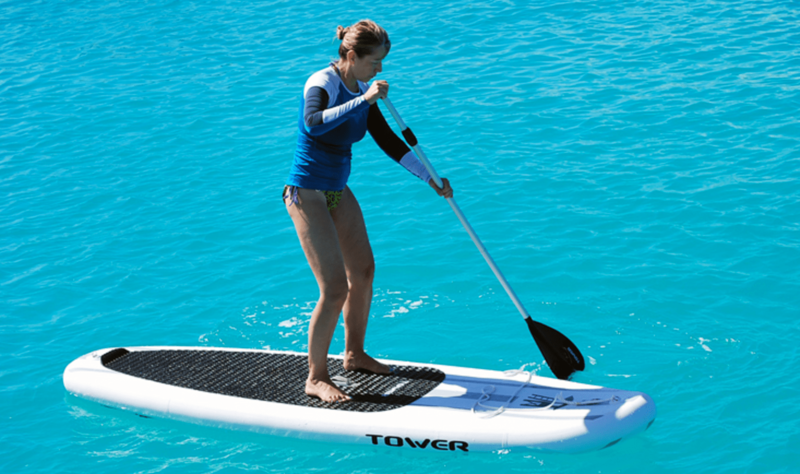 There are four main categories when it comes to stand-up paddle boards: race, touring, surf, and all around. Race style boards are designed to be fast and cover large distances. Those interested in racing will need fast and efficient boards. Touring boards are similar to race in that they are made for covering large distances, but speed is not as important. Surf style boards are made for catching waves where maneuverability is important, but long distance riding isn’t. All around boards are a balance between all of the above factoring in speed, maneuverability, and stability. Knowing what performance aspects you require will help you choose the best board for your purpose, otherwise, all around boards are a great intro to the sport. Board length is generally dictated by the purpose of the rider. Short boards are usually under 9″ long and are great for surfing as the shorter board is easier to maneuver. Racing boards can be longer than 14″ as the long narrow boards cut through the water and maintain forward speed with less drag. All around boards are usually around 10-11″ and are great for calm lakes and can even be used in the surf. When considering board length do not forget about storage and transport for your paddle board. It can be tricky fitting huge 14″ boards on top of a small car or in an elevator to get back to your apartment. Inflatable boards are a great option for those with transport or storage issues. These boards are made of highly durable materials and can be pumped up with air to reach full size and strength.